With the completion of the PEM735, a comprehensive class A1) power distribution network analyzer, Bender is expanding its range of universal measuring devices. The PEM735 monitors the power quality in accordance with DIN EN 501602). Such a measurement at the point of common coupling makes it possible to evaluate the "ambient conditions" for electrical equipment in relation to the voltage. Power quality phenomena are often the cause of failures in process installations or premature material fatigue. Increased harmonics or irregular voltage fluctuations, so-called flicker, can also affect the expected service life of electrical equipment. 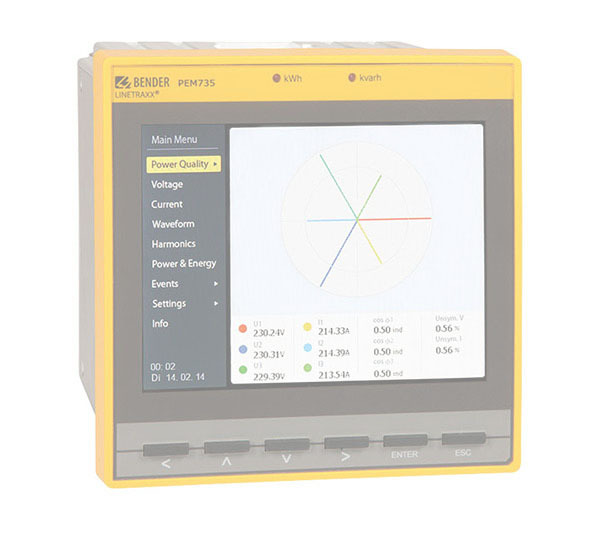 With a class A power quality analyzer all relevant characteristics of the voltage can be monitored and evaluated. The measurement and analysis features range from the frequency, through harmonics, to transient events and flicker. Due to the high sampling rate of the PEM735, high frequency harmonics caused, for instance, by inverters can be measured. If power quality events occur, for example voltage fluctuations or transients, the PEM735 records high-resolution current and voltage waveforms. The data are stored locally in a memory with a capacity of 1 GB. The measurement results can be accessed via 5.8“ color display on the device or via fieldbus communication such as Modbus; they can also be displayed on a PC workstation via a web server. The device also supports other formats for data export such as COMTRADE or PQDIF. IEC 618503)-compliant communication is also supported.